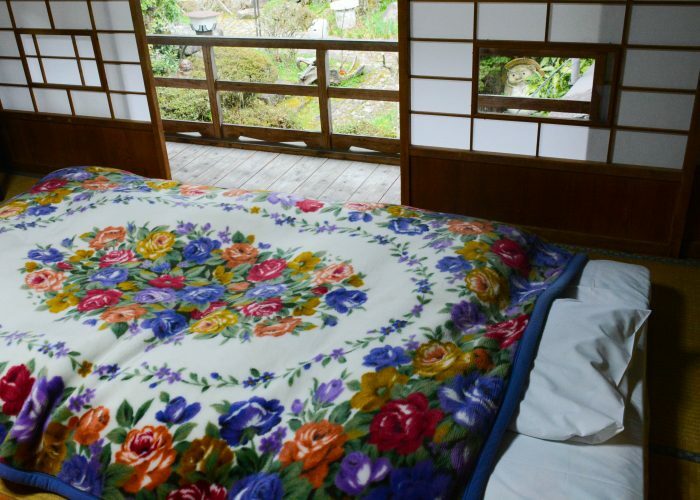 When you walk into a Japanese ryokan—or traditional Japanese inn—you should be tired and dirty. Your back should ache and your feet should be sore. The best way to experience a ryokan is the way the people they were built for did. Along Japan’s old highways, innkeepers welcomed weary travelers who had walked long distances—and who likely still had a long journey ahead of them. When travelers arrived at the inn, exhausted and dusty, the innkeepers knew just what to do with them. Always in the same order, guests were welcomed in, served hot tea, and offered fresh robes to change into before dinner. When you follow this order and respect the rules of a traditional ryokan, you are doing more than just being culturally polite. You are taking part in a ritual of relaxation and hospitality that has been in practice for centuries. Though these customs can be tricky for Western visitors to navigate at first, they’re well worth the experience. By the time you walk out of the door the next morning, you’ll be clean, well-fed, and ready to take on a brand new day. Just like in Japanese homes, it is customary to take off your shoes before entering Japanese inns. In the doorway, there will be a place to store your shoes; your hosts will provide you with optional slippers to wear in the ryokan. Once you’ve shed your shoes, you’ll begin to feel right at home. There’s no shame in skipping the slippers, walking around in your socks, and letting the soft straw texture of the tatami mats massage your feet with each step. 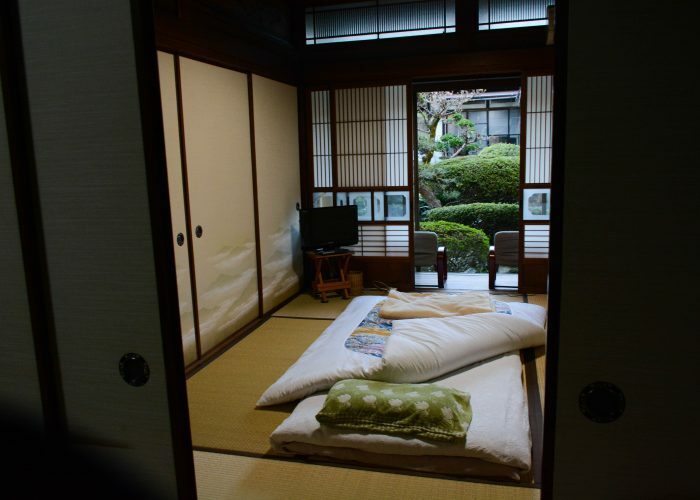 More modern ryokans might not require you to take off your shoes until you get to your room. No matter what, though, you should never wear your shoes on the tatami mats. Ryokans have a long tradition of hosting travelers that walked along the old Japanese highways, and some of these inns have been in the same families for many generations. Hospitality is a proud tradition here, and nowhere is it more apparent than at these traditional Japanese inns. Innkeepers strive to make your stay as enjoyable and relaxing as possible, so don’t be afraid to let them know if you need help. Among the proud traditions of ryokans, sitting down for a hot cup of tea after checking in feels like the most welcoming. Typically, tea and some kind of sweet treat are served in your room, though if you are part of a large group, you might find tea being served in the dining room. 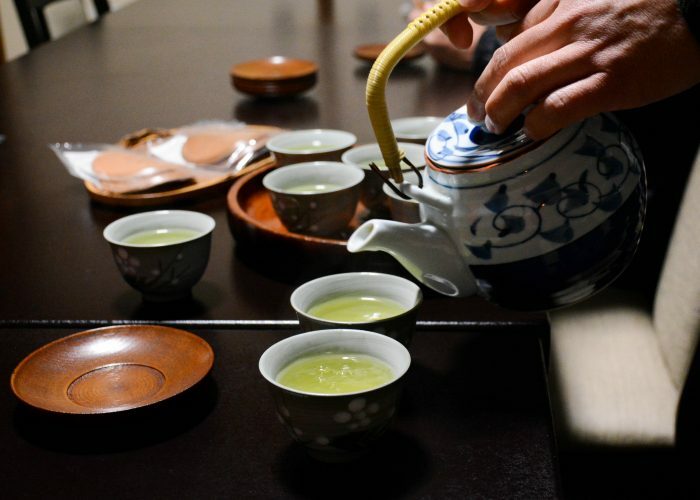 Japanese green tea is the norm here, and while you certainly don’t have to partake, it’s a refreshing treat, especially after a long day of travel. Throughout the ryokan, you’ll not only find slippers you can borrow for inside and outside but also slippers just for the bathroom, which you’ll see as soon as you open the restroom door. These must stay in the bathroom after you are done using them. Walking out with the bathroom slippers is a mistake every Westerner is bound to make once or twice, but try not to get too far before noticing your error and returning them to their place. 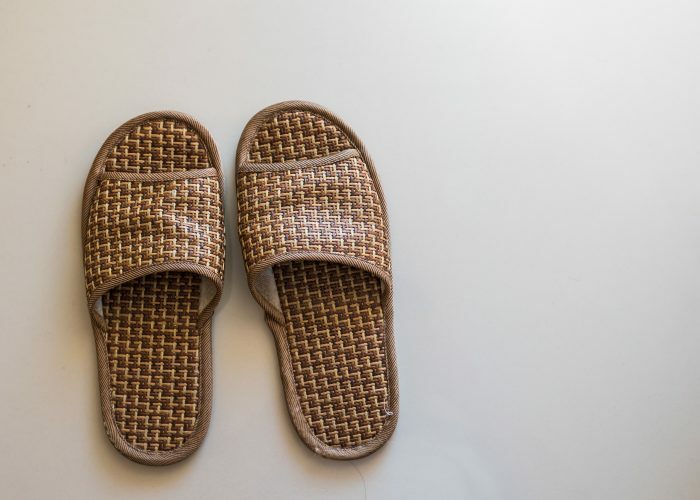 Bathroom slippers are considered dirty, so you don’t want to be caught tracking germs all over the inn, especially not on the pristine straw tatami mats. Depending on the age of the building, your room may not come with its own bathroom or shower. The thought of sharing a bathroom with the other guests might not be immediately appealing, but it’s a quintessential characteristic of Japanese hospitality. 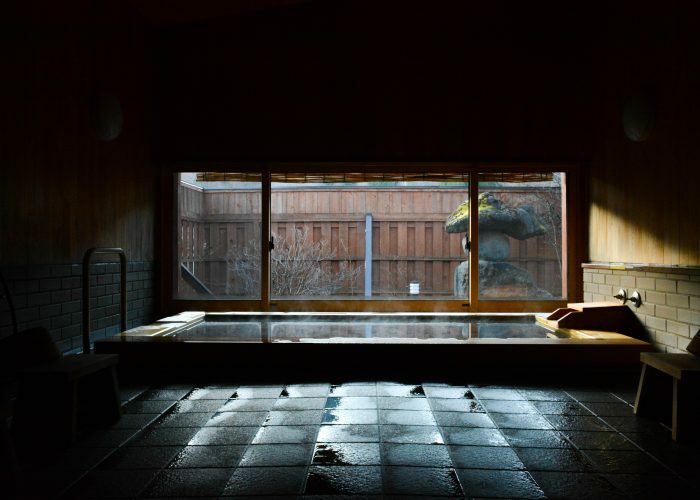 Many ryokans feature on-site onsen, or public hot springs, that you can use if you’re not feeling shy. Note that it’s customary to shower before getting into the bath so you don’t dirty the water. Once you’ve taken a hot bath, it’s time to get ready for dinner. The best part is, you don’t have to decide what to wear. 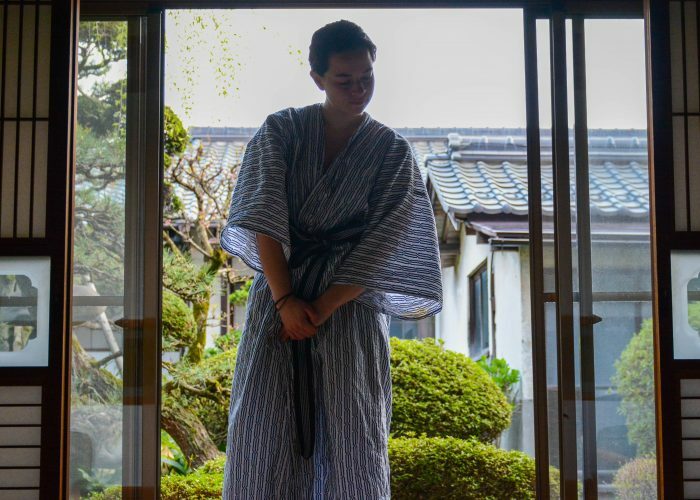 When you stay in a ryokan, you’ll have the opportunity to dress in the traditional yukata, a cotton robe that doubles as both pajamas and formal wear. You’ll either find the yukata in your room or the innkeeper will provide you with one when you check in. Wearing it to dinner is expected, but you’ll also find it’s quite comfortable to sleep in. Multi-course dinners are part of the traditional experience and are usually included in the price. A ryokan feast is the ideal way to dive into Japanese cuisine and sample many different delicacies in one sitting. At some ryokans, you’ll eat in the Japanese style sitting cross-legged on the floor, but others are more Westernized and offer high tables and chairs. Real Japanese futons are nothing like the transformable couches you’ll find in the average college dorm room. Futons in Japan are thin mattresses stuffed with cotton or wool that are designed to be folded up and put away in the closet when not in use. Though they can be quite comfortable, some Westerners might find it hard to sleep with so little between them and the floor. In that case, you can check the closet for extra futons and double up, or ask the innkeeper for an extra. In less expensive ryokans, your bed might not be made when you arrive; you’ll be expected to assemble your own. In that case, you’ll find the futon and all the bedding in the closet. One of the most famous features of Japanese architecture is shoji, the translucent paper room dividers. They are lovely to look at, but don’t offer much in the way of privacy. Always be mindful of other guests who might be sleeping, and remember that whatever is said in your room might be heard by your neighbors next door. You might still be full from dinner the night before, but at a ryokan, you’ll need to bring your appetite to breakfast as well. 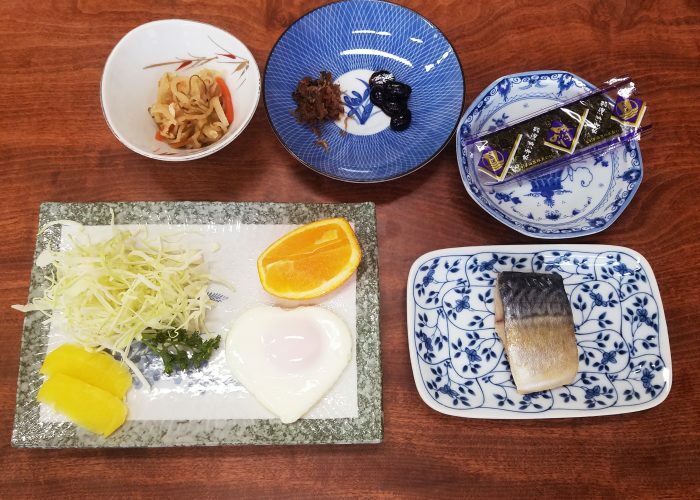 Western breakfasts featuring fruit, eggs, and bacon are generally available upon request, but most ryokans favor a Japanese breakfast complete with fish, miso soup, and rice. Coffee is not guaranteed at all ryokans, and if they do have it, there’s a good chance it will only be instant coffee. If you know you’ll need a stronger dose of caffeine than what a cup of green tea can provide, pack your own instant coffee to have at the ready. 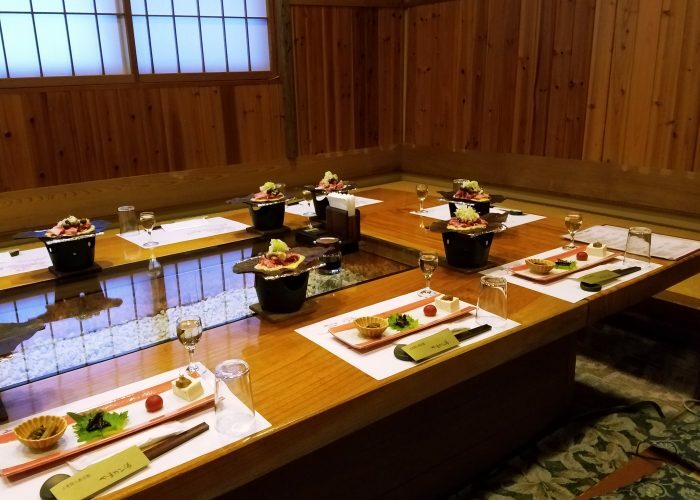 Jamie Ditaranto traveled to Japan and experienced many different styles of ryokan as a guest of Walk Japan. Follow her on Twitter @jamieditaranto.